In this post, we look at how to integrate these two popular frameworks into your Java app in order to perform data ingestion. Before reading this article you need some basic knowledge on REST, Spring Boot, and Spring Batch. This article is focused on how to ingest data using Spring Boot/Batch and the HBase REST API. As Spring for Apache Hadoop project will reach End-Of-Life status on April 5th, 2019, using the REST API with Spring Batch helps us to interact with HBase directly from a Windows environment, so you don't need to deploy your jar to a Unix/Linux environment where your HBase is running. Now we are ready and have HBase's REST API up and running. Let's create a sprinboot-batch project and create our classes for file ingestion. Reading and writing multiple files with Spring Batch. Integrating REST APIs in an item writer. Invoking HBase's REST API for ingestion. Here we are going to ingest each file as a single column in an HBase table and file name as row-key of that HBase table. 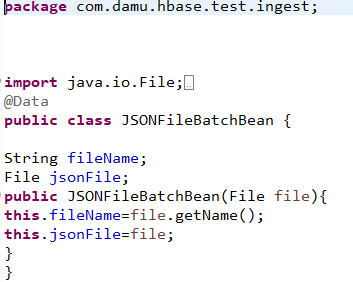 First, create a Java bean to define the file details that we'll use across the project. Here are the table structure and URL details.